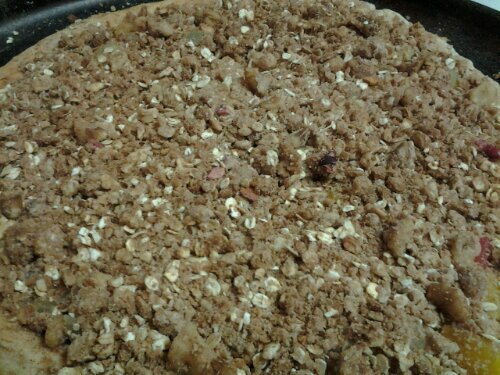 The above link is what the recipe began as and the following Miss Polly’s Fruit Pizza with Cinnamon Sugar Crust is what happened when I looked around in the kitchen and made the most of what I had on hand. 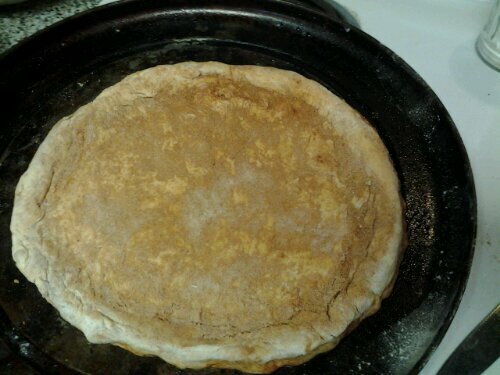 2 tablespoons granulated sugar to top on the crust one you laid it out to fit the 12 inch pizza pan. 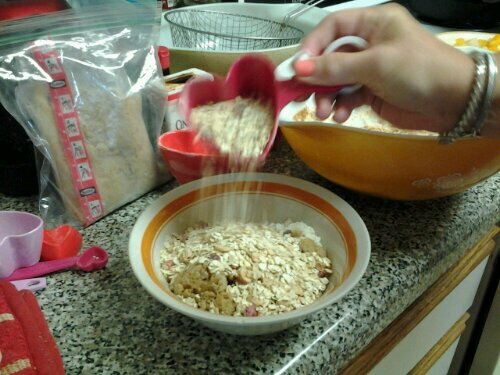 Mix all ingredients for the dough in a large bowl, and stir with a large metal or silicone spoon. Mix thoroughly and work in with your clean hands. 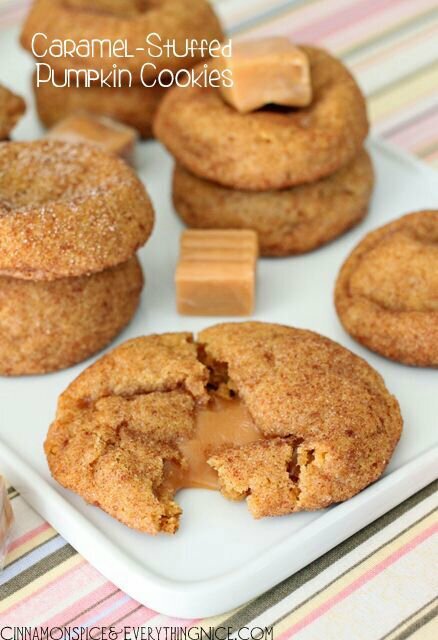 Mix with your hands until you form a nice uniform ball that has no wet pockets in it and it feels the consistency of baking powder biscuits. Roll out on a large pizza pan with your hands and lay out the dough as thinly as possible. Form a lip around the edge in a circular pattern so the filling/topping won’t leak out on the pizza pan. 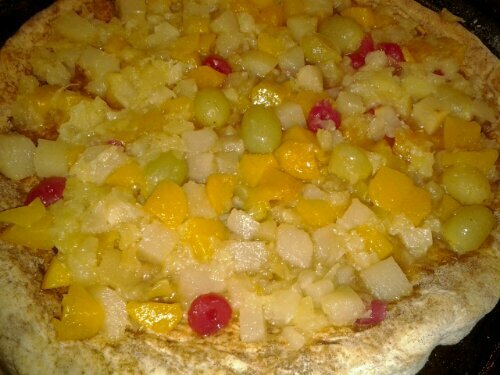 For this one I had no fresh fruit in the house, and it came out really good using one 14 ounce can of large chunk drained fruit cocktail and one 14 ounce can pineapple chunks with no sugar. 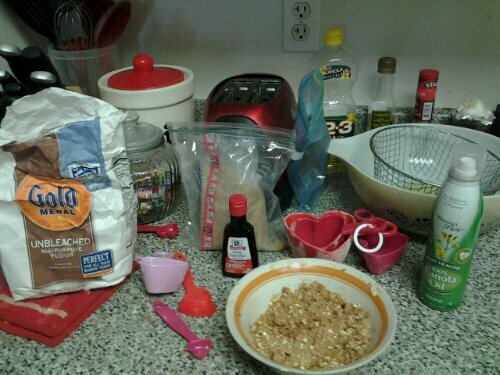 I added 4 tablespoons raw sugar to the fruit and one teaspoon pure vanilla. Top with this if you like a more sweet and rich flavor. 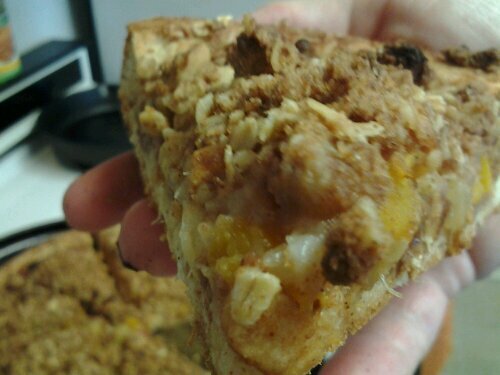 You can also simply sprinkle confectioner’s sugar and cinnamon in a shaker after the Fruit Pizza is baked. Drizzle on when the pizza is baked and thoroughly cooled. The beauty of this cinnamon roll recipe is you can mix it up and have it on standby in your refrigerator up to two days before you want to bake it. Then you take it out in the morning, shape it and let it rise and bake. Then you have many happy recipients who get to taste them. My Nanny and dad used to make this when I was a kid and using Carnation Evaporated Milk gives the fresh toast a nice tenderness & richness. It is also great with your French Press coffee you make to go with the French Toast. I can still see Nanny mixing the eggs in a big aqua Pyrex bowl and making breakfast for our family. Whip the eggs with a fork and add evaporated milk to it until the eggs are mixed. Add however much ground cinnamon you like and stir some more. 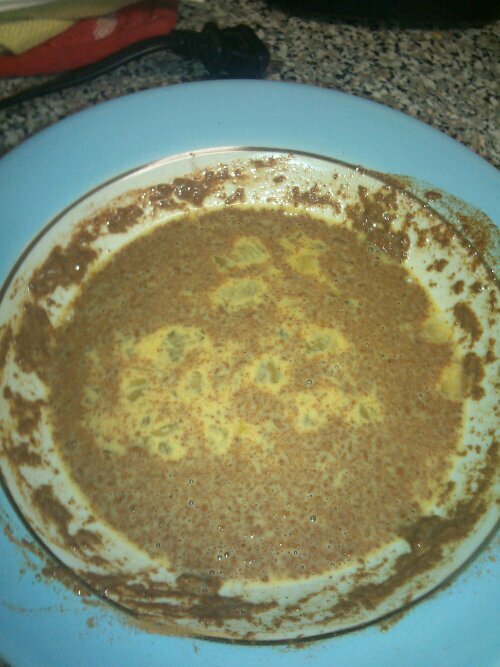 Dip the bread in the egg mixture until both sides are coated. Cook on a hot non stick griddle or pan that has corn oil or melted butter (or a mix of both) on it. Cook for about a minute, until egg mixture is cooked on both sides. 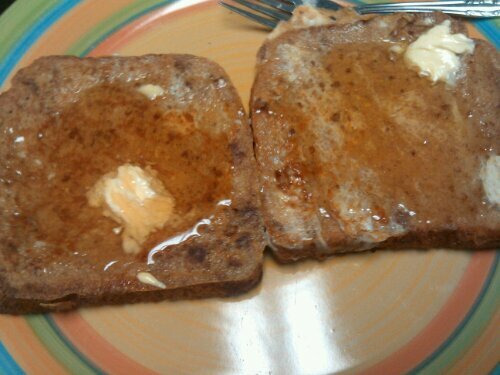 Serve with honey and butter or maple syrup or fresh fruit. 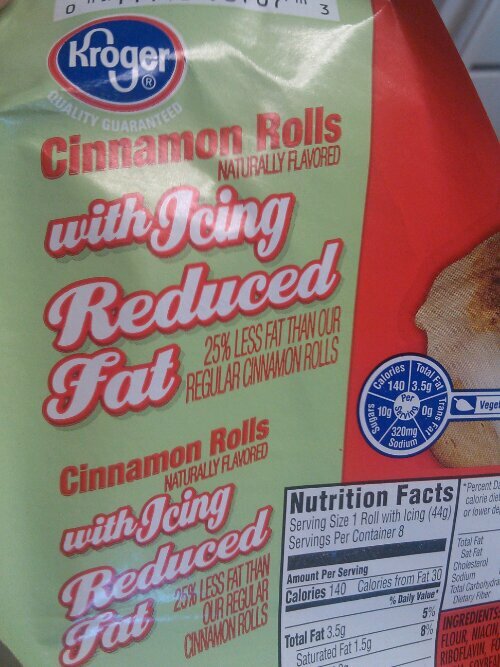 Cinnamon Rolls…Believe it or Not-They Are Low Fat! I found this new product when I was at the store last time in the refrigerated biscuit section by Kroger at Ralph’s. They baked up tender and perfect and so easy to bake a young child could make them with supervision. Just heat the oven to 400 degrees and gently form them as you would your home made variety and they will be done in about 12 minutes, depending on how hot your oven is. Perfect when you want something quick and don’t want a messed up kitchen or dishes- but want to impress people. These have the added boon that you could have your kids help you on this one and they will be so proud and you will too! Hope you are having a Delicious Day so far. 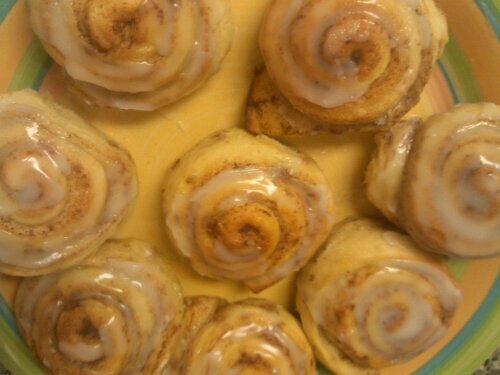 Cinnamon Roll Donut Bites Streamlined with Refrigerator Rolls! Every now and then I run into something simple but extraordinary for busy days…and this one of those recipes which just about make themselves. I found these on the picture sharing site Pinterest.